Contrary to popular public perception, the artificial heart was not invented by Dr. Robert Jarvik. Jarvik was just a child when the pioneering developers of the artificial heart began their work. Doctors Willem J. Kolff, Don B. Olsen, Michael DeBakey, John H. Gibbon, and Clarence Dennis, are among the best-known inventors of heart-lung bypass machines and other mechanical heart devices. But one of the pioneering inventors of the artificial heart is virtually unknown today for his work as an inventor. This man held 30 different patents. They include a disposable razor, a flameless cigarette lighter, illuminated ballpoint pen, retractable fountain pen, an "invisible" garter belt, an inverted novelty mask, battery-operated heated gloves, a portable blood plasma defroster, a sectional garment for hypothermia, a piezo-electric diaphragm, and an artificial human heart. Despite all his accomplishments in the field, he was not known as an inventor to the general public. Paul Winchell was better known as a master ventriloquist and entertainer. His long-running Paul Winchell-Jerry Mahoney Show made him popular with millions of children growing up in the 1950s and '60s. The Grammy award-winning performer further cemented his fame by providing the voice of Tigger for more than 30 years, in the classic Winnie the Pooh films. In the mid-1950s, Paul Winchell studied pre-med at Columbia University. He was involved with projects for the American Red Cross and the Leukemia Society--work that led to several medical patents. 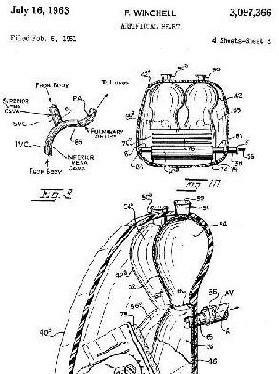 The artificial heart he patented was a collaboration with Dr. Henry Heimlich, inventor of the maneuver to save choking victims. After Dr. Robert Jarvik was repeatedly--and erroneously--referred to as, "The inventor of the artificial heart," Dr. Heimlich made a television talk show appearance alongside Paul Winchell to confirm, not only the story of Winchell's early work and patent of his artificial heart device, but also to verify the fact that Winchell's work and patent of his artificial heart had occurred many years before Jarvik's artificial heart was produced. Paul Winchell was the recipient of an honorary doctorate in Science for his invention and patent of the artificial heart. Winchell was granted a patent for his artificial heart many years before Robert Jarvik began work on his device at the University of Utah. Paul Winchell later donated his patent to the University of Utah. U.S. Patent Office documentation for Paul Winchell's artificial heart appears in the three photos displayed to the right. 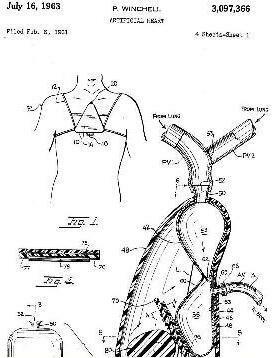 Documents from the United States Patent Office show that February 6, 1961, Paul Winchell filed for a patent on his artificial heart. He was granted a patent (3097366) on July 16, 1963. The paperwork on patent 3,097,366 explains: "This invention relates to an artificial heart and more particularly to an artificial heart capable of substituting for a natural human heart in moving blood through a human body. A principal object of the invention is therefore to provide an artificial heart adapted to be mounted in the mediastinum in the chest of a human or animal as a total replacement for the original human or animal heart. 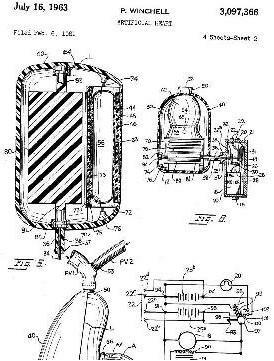 It is another object of the invention to provide an artificial heart in which the moving parts are sealed within a container made of a material which is nontoxic and nonirritating to the human or animal body and inert with respect to body fluids, the several moving parts being made of tough, durable material which will not wear out in use, such as nylon, and the like." NOTE: It is not our intent to diminish the significant medical accomplishments of the above doctors. While several of them hold patents for various medical devices, including new and improved artificial hearts, we simply wish to clarify the fact that Dr. Robert Jarvik is not the original inventor of the artificial heart, as is commonly believed by many.